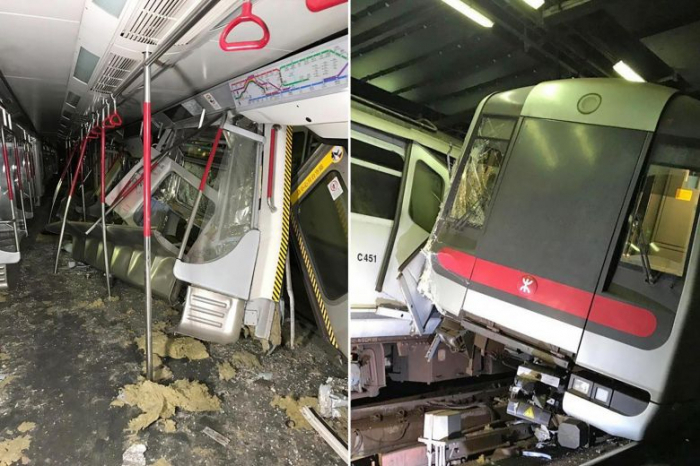 Two drivers were sent to hospital as one was reportedly injuried in his leg after two Hong Kong MTR trains collided with each other on Monday morning, AzVision.az reports citing Xinhua. Train services between Central and Admiralty stations on Tsuen Wan line would be suspended for the rest of Monday, according to MTR Corporation. Train services between Tsim Sha Tsui and Tsuen Wan stations on Tsuen Wan line would be departed every three and a half minutes. The incident took place near Central station at around 3 a.m. when a Tsuen Wan-bound train collided with a Central-bound train at the crossover section during a trial run for a new signal system. Deputy commander of the Hong Kong Island Central Division of Hong Kong Fire Services Department said they received a call at 2:55 a.m. local time, referring to the collision of two trains at the MTR Central station. "The firefighters arrived five minutes after receiving the call. The scene of the incident was about 100 meters from the platform of the Central station on Tsuen Wan Line. The accident involved two trains, one of which was in the direction of Central station and the front of the train was damaged," the official said. "The other train was in the direction of Tsuen Wan station, and the third and fourth carriages of this train were damaged." Hong Kong MTR services carry about 5.8 million passenger trips on average on a normal week day. The MTR corporation urged commuters heading to Central station to change at Admiralty station for the Island line or take alternative public transport.